Wahey! Thursday is new magazine day around these parts and look what I found? 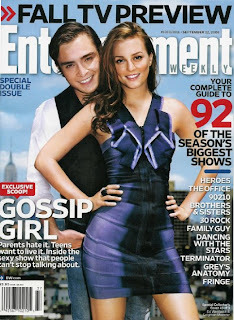 A 'Gossip Girl' cover bonanza! There are actually three covers to this set (the third features 'Nate' & 'Vanessa' -- hmmm, yeah I agree. That coupling is not as interesting as these pairings). From my own personal unscientific survey, the Chuck & Blair issue is outselling the other two. I scored the last one! Kudos to Entertainment Weekly for granting us cover stars that we actually want to see. 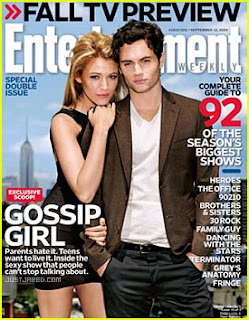 I guess it does help that EW is owned by Time-Warner, who *also* owns the 'Gossip Girl' franchise. Incestuous, yes...but at this point, I don't care!